Hi, I’m Sarah, and I love Halloween. I still dress up (I firmly believe there is no such thing as “too old”) and I’ve even been known to hand-make a few of my costumes. But you know who loves Halloween even more than me? Every single kid, ever. That is a scientifically proven* fact. Nigel the Ninja is also, technically, a kid (if you don’t know Nigel’s backstory, check out the short version here). He’s happy to get costumed up to celebrate Halloween! 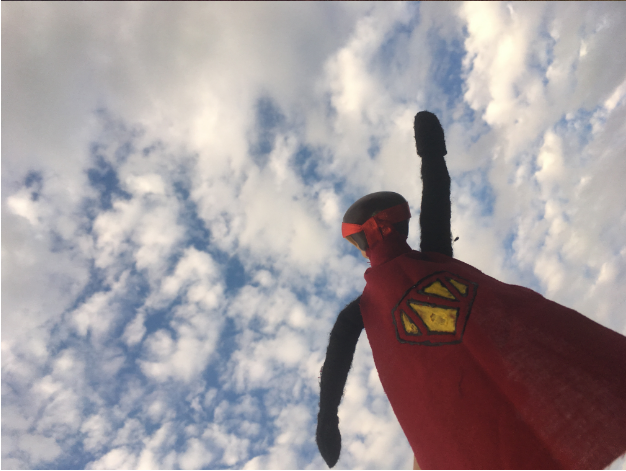 You could make a costume for him with your kids, as part of a family arts-and-crafts activity, or make him one yourself and surprise them. Either way, your kids will love it! I recruited my mom and one of my sisters, and we tried our hand at making a few Nigel costumes. It was a blast! Here are the costumes we came up with. You can use or modify them however you want. They were all made with craft supplies I already had lying around, plus a few supplies from a hobby store that cost about $7. Cut a fabric square approximately 8”X8” (this doesn’t need to be a perfect square, and this size is just a suggestion. Fold it in half. Unfold it, and there’s your cape! Turn it over so the outward-facing side doesn’t have any pencil marks on it. I used fabric paint to create the Super Ninja/Super Nigel logo. First, I lightly traced it on with pencil then went over it with the paint. 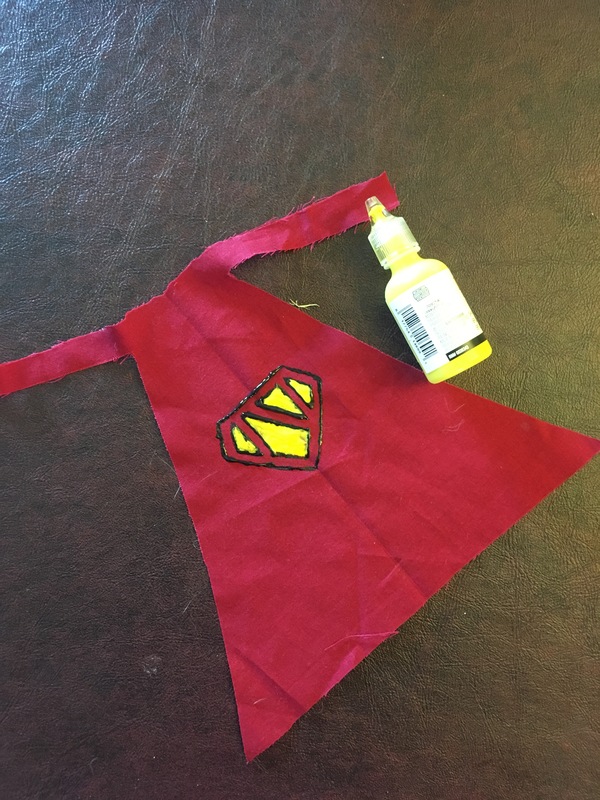 The red fabric was pretty bright, so I wasn’t sure how well marker would go on, but a white or light-colored cape would probably be easier to color. If you use multiple colors of fabric paint, make sure you let the first color dry before adding a second. I didn’t (I am an impatient person) and I had to do some touch-up work on the resulting smudges, but I’m happy with how it came out! 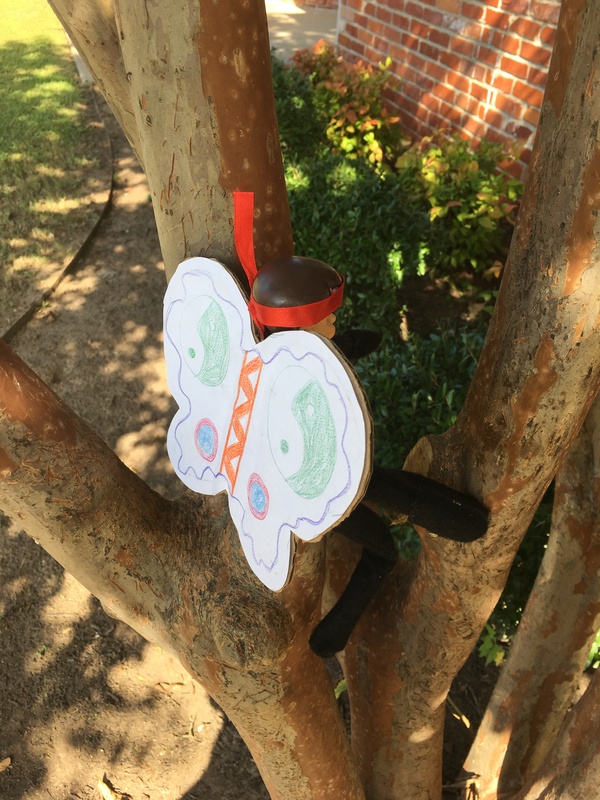 Got a budding entomologist in your family? This one’s perfect for you! 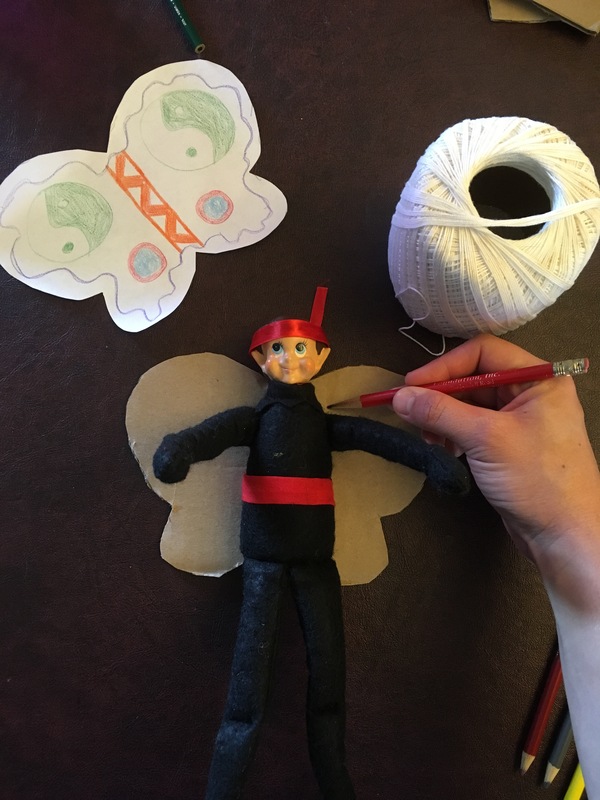 It’s a great one for kids to make, because it allows them to have a main role in the costume’s creation, with no more than simple coloring. Fold the piece of paper in half. 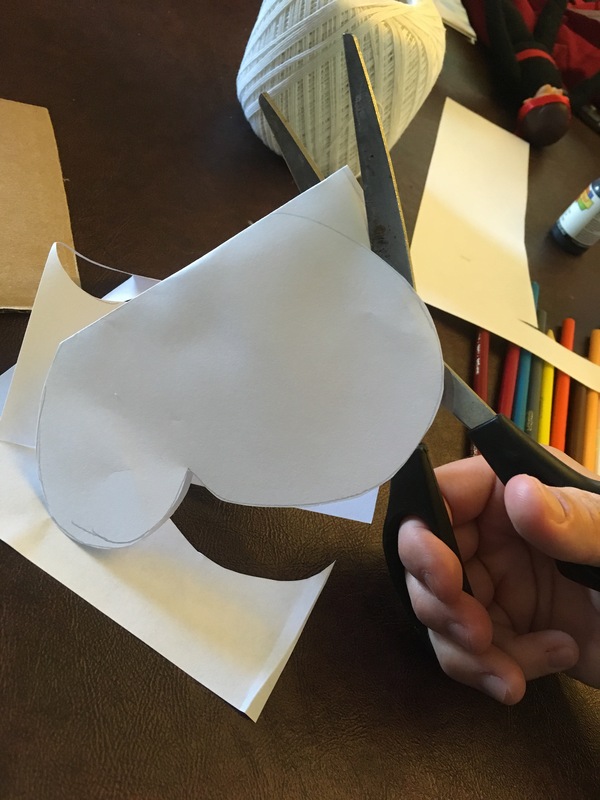 Draw any shape of wing you want, with the fold as the center of the wing. 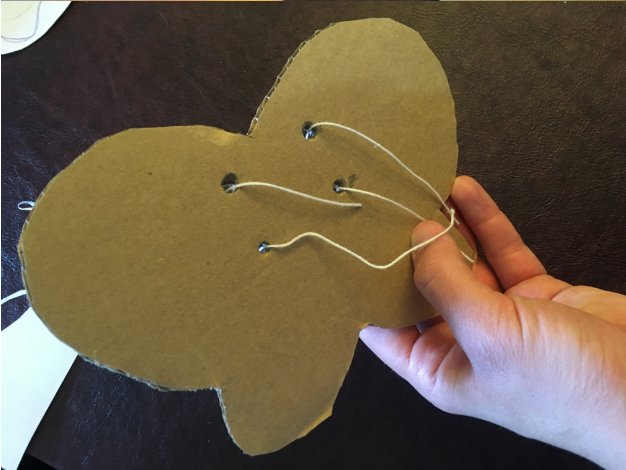 Unfold the wings, and trace their shape onto the cardboard. Cut it out. Let your child (or you!) color one side of the paper wings. I gave that task to my sister Hannah, who did a magnificent job. Look at the artist, bent over her work. Sheer dedication, folks. Mark four points on the cardboard wing: one above each of Nigel’s shoulders, and one below each of his armpits. 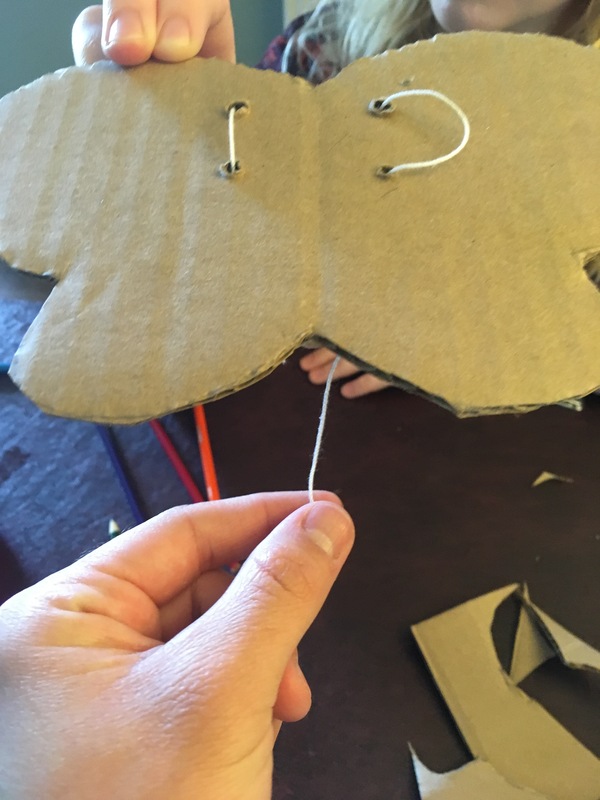 Use the sharpened pencil to poke holes through the cardboard. Cut two lengths of string (about 8”, to give yourself some wiggle room – you can always cut them down later). Thread one piece of string through each shoulder/armpit hole set, and adjust the strings to be about the same length. Pull them tight. Take the colored paper wings, and put glue on the blank side. Set these wings over the back of the cardboard wings (the side with no string-ends sticking out) and press into place. Let the glue dry. When it’s set, you can turn it over and color the cardboard side of the wings, too. 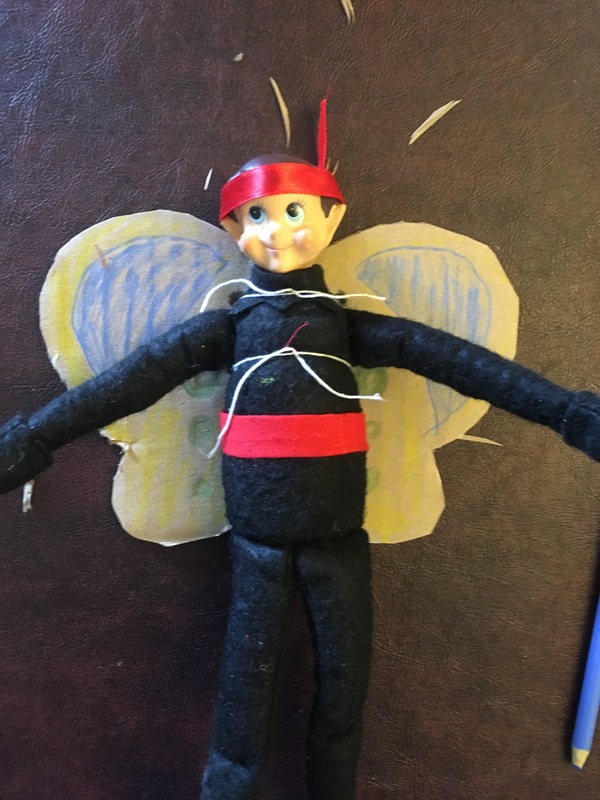 Use the strings to tie the wings onto Nigel. 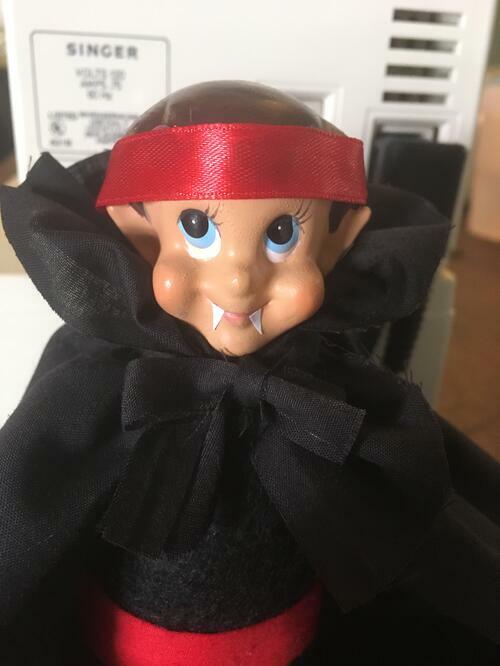 In popular mythos, vampires come in a variety of ranges from sinister to sparkly – but Nigel the Vampire is just plain cute! 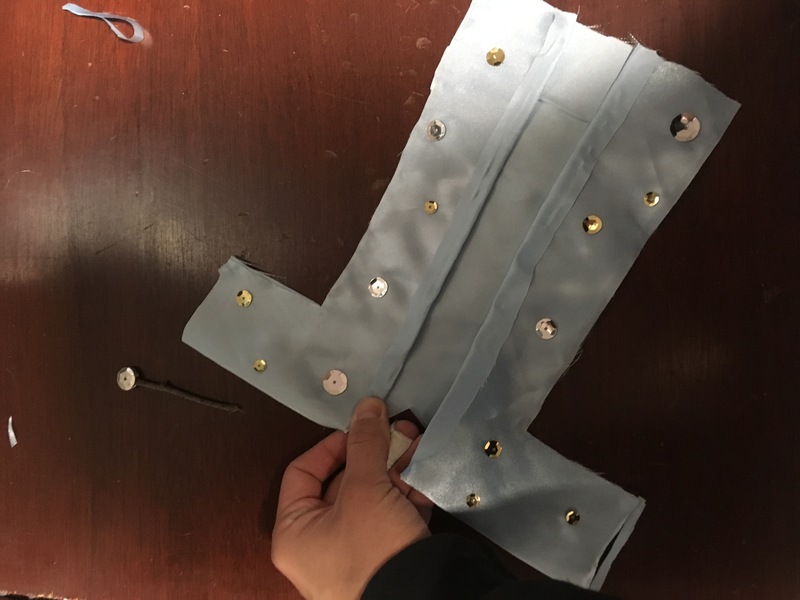 This costume had us busting out the sewing machine, but it’s not necessary to use one, if you don’t mind a little hand-stitching. 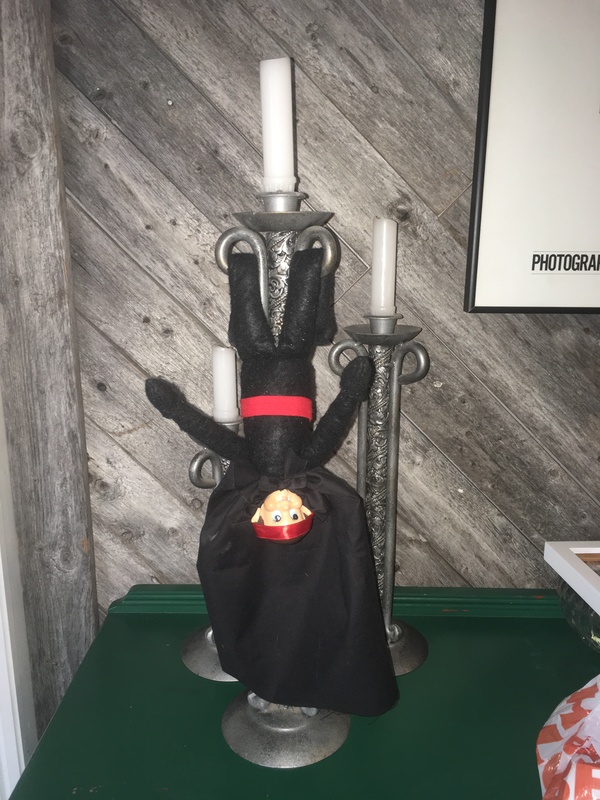 My mom took the lead on making this one. She is far and away the most experienced of the three of us, and knows how to handle the quirks of our ancient sewing machine. The start is similar to the Superhero cape, except you’ll want a larger piece of fabric. I’d say maybe 10”X10”. The extra width will allow the cape to wrap around Nigel a bit more, like a proper vampire’s should, and the added height will go into making the collar. You’ll also need an extra, long strip of fabric to tie the cape on. To make the collar on the cape, get your sewing machine (or needle and thread) ready and threaded with the right color. 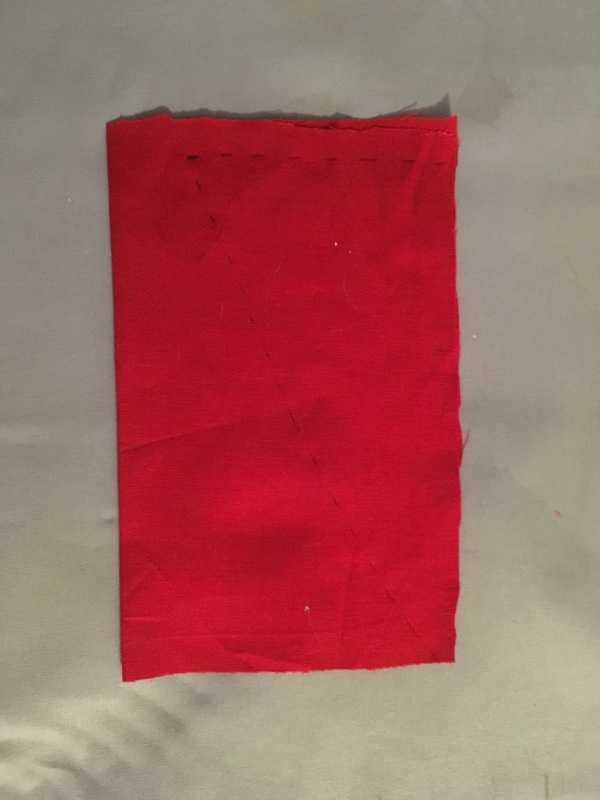 Sew two lines, about ¼ inch apart, an inch down from the top of the cape. 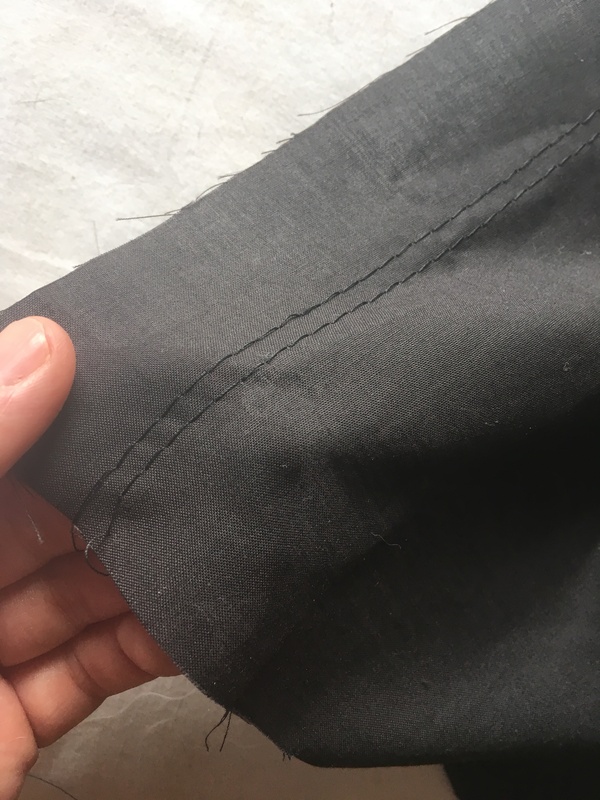 Leave extra thread sticking out on both sides. Gently, gently pull on all four ends of string at the same time. This will cause the fabric to ruffle (“It’s called gathering,” my mom says), creating the collar. Adjust the gathers to form the shape of the collar. Tie a knot in each thread and snip off the excess. Using the long, thin strip of fabric, tie the cape around Nigel’s shoulders. For fangs, use the scissors (a nail scissors might work best) to snip out two small, thin triangles from the sticky part of the Post-it, and press them onto the edges of Nigel’s smile. Here was where the craft store run came in. Hannah and I spend half an hour trying to find star-shaped sequins, to no avail. We also got some very wizard-y blue fabric for the robes. Tip: Most fabric and craft stores will sell small swatches of fabric that are left over from the ends of rolls at very cheap prices. These are perfect for making Nigel-sized costumes! Fold your fabric in half. Lay Nigel on top of it, with his head above the fold. Trace a large “T” shape around him (you can cut it down to size later, as needed). 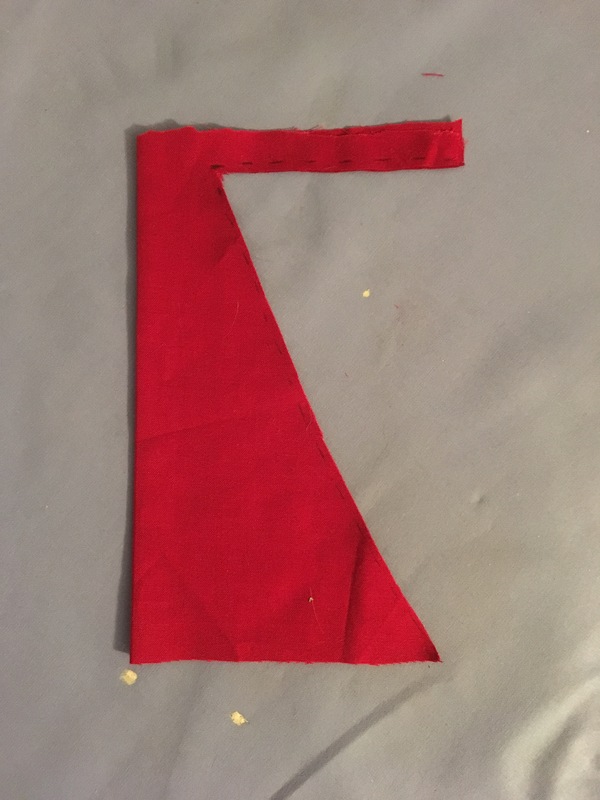 Cut the shape out, leaving it folded. In the center between the sleeves, cut out a hole for Nigel’s head. Hot-glue (or sew, if you’re getting all fancy) the underside of the sleeves, as well as the sides of the robe, together. 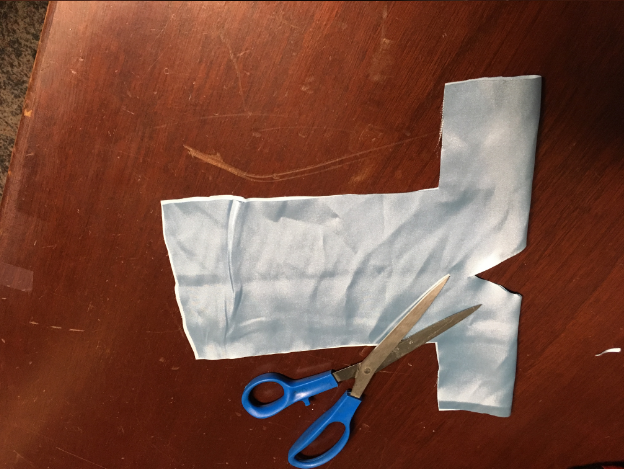 The top half of the sleeves should already be attached, because of how you folded the fabric. 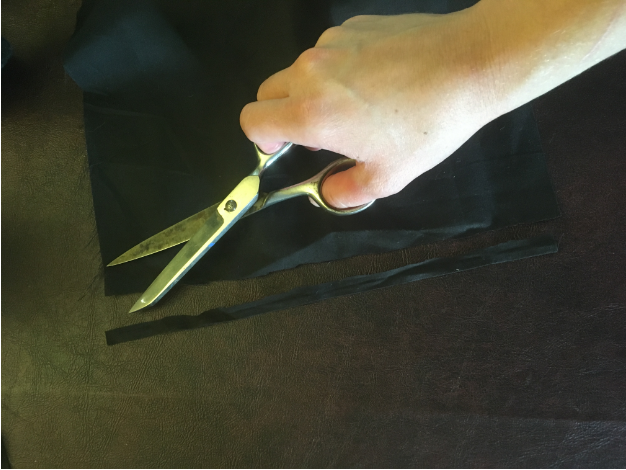 Once you’ve done this, cut open the front half of the robe. 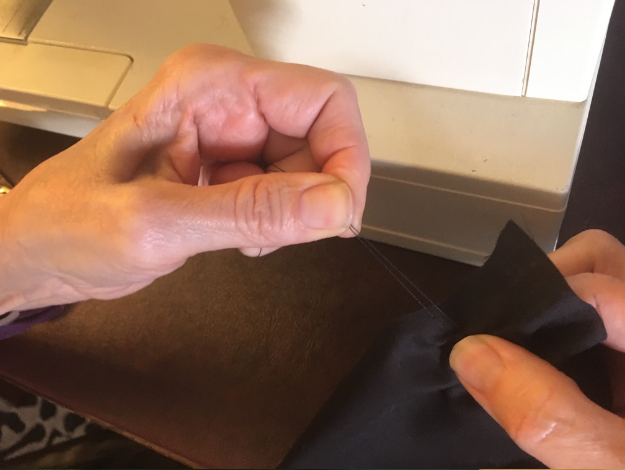 Fold a ½” to ¼” section of the robe opening back to make a trim, and sew or glue it in place. Attach the sequins onto the robe. The ones we found were self-adhesive, but you could use glue or, again, sewing. To make Nigel’s wand, glue two sequins to either end of the twig. If you have leftover fabric, make Nigel a hat, too! Make a circle by tracing the bottom of a cup on paper (the one I used had a 3.5” diameter. A little variance won’t hurt, but I’d shoot for something around that size). 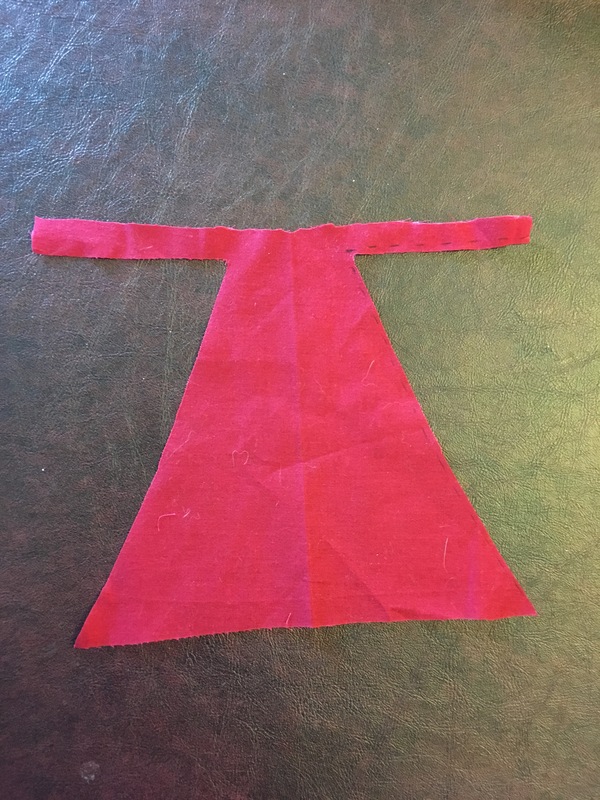 Cut out the paper circle, and use it as a template to cut two more circles from the cloth. Glue one of the fabric circles onto the paper circle. When the glue has set, cut a slit into the center of the circle. Take one side of the cut and bring it over the other, making a cone. Adjust the cone until the mouth is about the size of Nigel’s head. When it is the correct size, glue the upper cut edge onto the rest of the cone to hold it in place. Fold the remaining cloth circle in half and snip a small hole in the center. Unfold the circle and lay it flat. Line the mouth of the cone with glue and center it over the remaining circle. Press down to secure it. Once it is dry, go back with a scissors or small knife to widen the hold to the edges of the cone, making a space for Nigel’s head. Decorate the hat with remaining sequins. I used a little bit of hot glue to affix the wand in Nigel’s hand. In retrospect, I do not recommend this. Nigel will fight you not to let that wand go. You will end up in a wrestling match with a felt ninja, worried you’re going to lose. 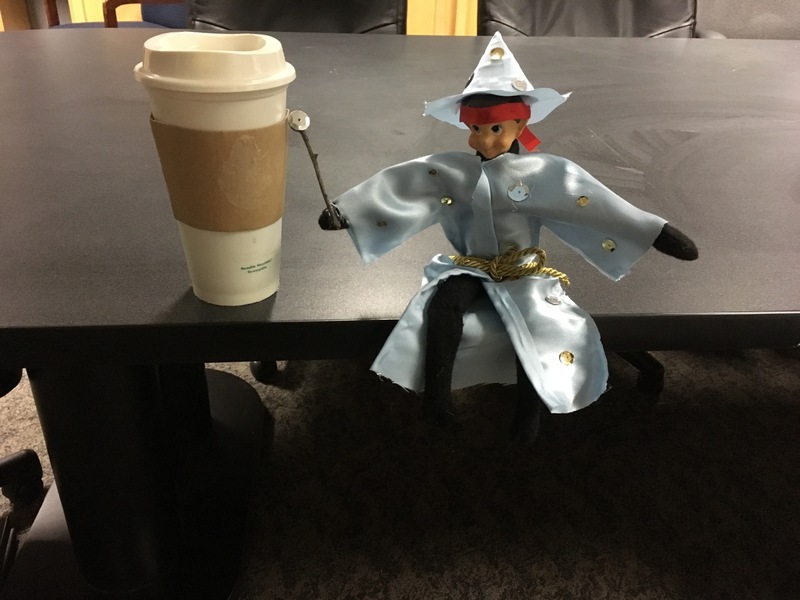 If you want him to hold the wand, I’d suggest instead using tape, or a little bit of stitching. If you do use hot glue, use the tiniest amount possible, and use glue from a gun that’s been unplugged for a few minutes, so you’ll get warm rather than hot glue. No Halloween would be complete without this simple classic! Literally all you need is a clean white handkerchief (torn patches and raggedy edges are OK. Boogers are not), a black marker, and some double-sided tape. Drape the hanky over Nigel’s head. The center of the handkerchief should be on the top of his head. Using the black marker, draw a ghost face on the hanky, above Nigel’s real face. Draw lightly, or else slip a sheet of paper between his face and the hanky before you draw, or the marker may bleed through and get on his face. 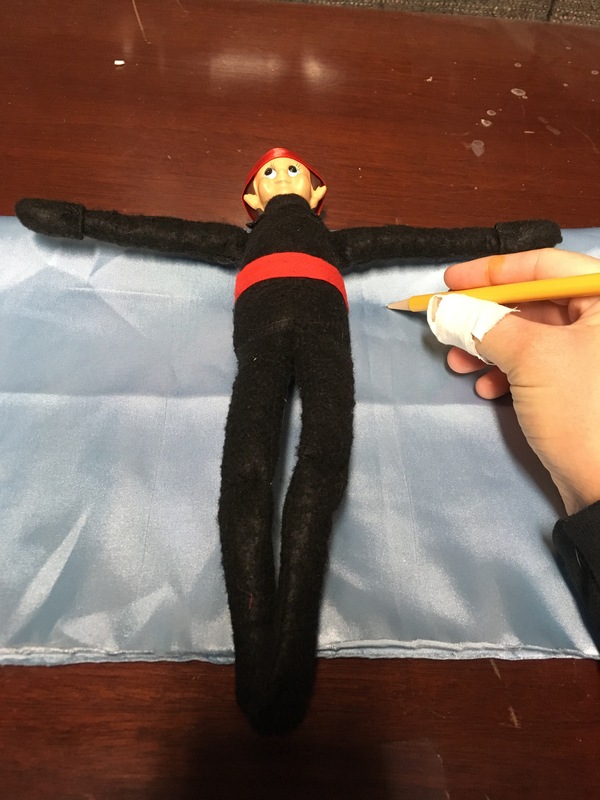 Once the face is drawn on, place one piece of double-sided tape on Nigel’s stomach and another on his back, and lightly press the hanky down to anchor it. The end! It’s that simple, and still pretty cute. 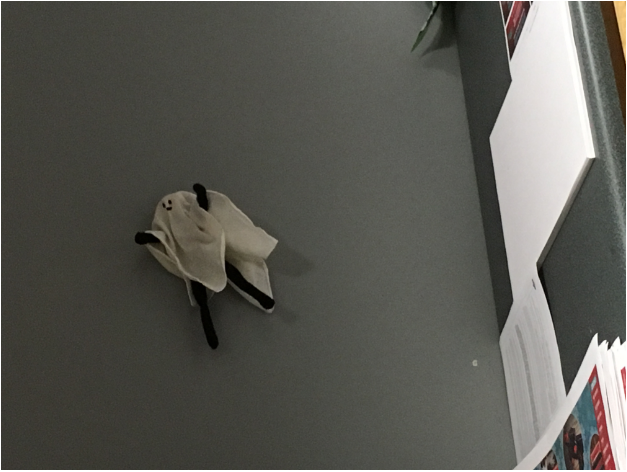 Ghost Nigel flying around the break room at work. Of course, the only limit on what Nigel can be is your imagination! You can make your costumes as simple or as complex as you like – at the end of the day, they’re all going to be greatly enjoyed and appreciated by your kids. 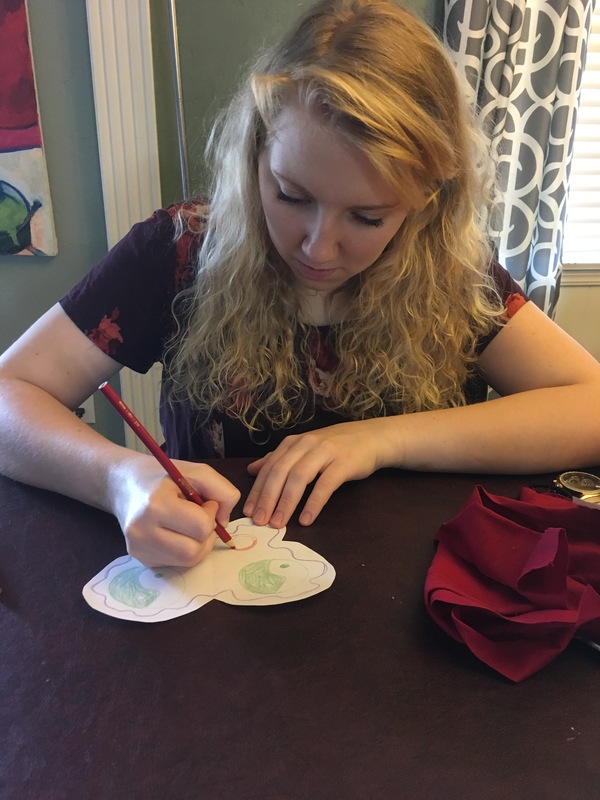 I hope you have as much fun creating them as my family did! 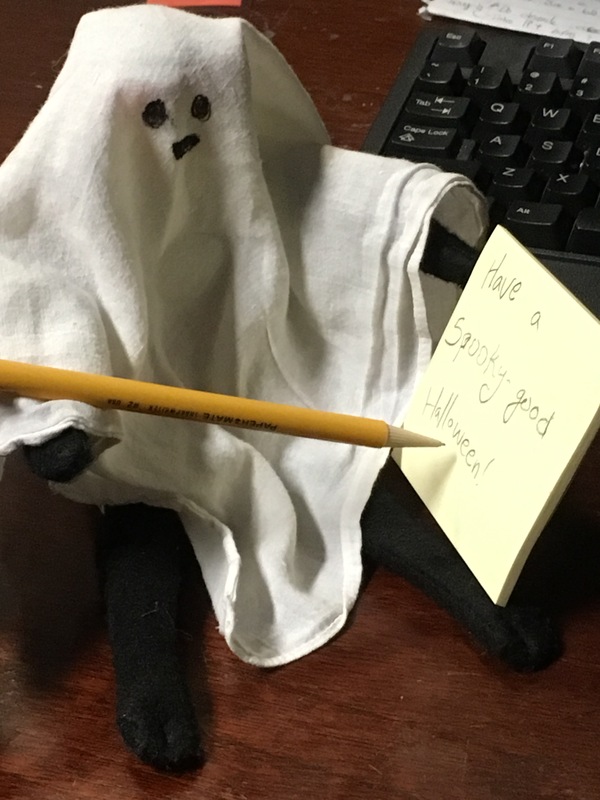 Thanks to Nigel, my ghostwriter (get it?)! Other ideas besides costumes: have Nigel lead your kids on a scavenger hunt to find their baskets before they go out to trick-or-treat. This fun game will keep them from getting too impatient as they wait to collect candy.